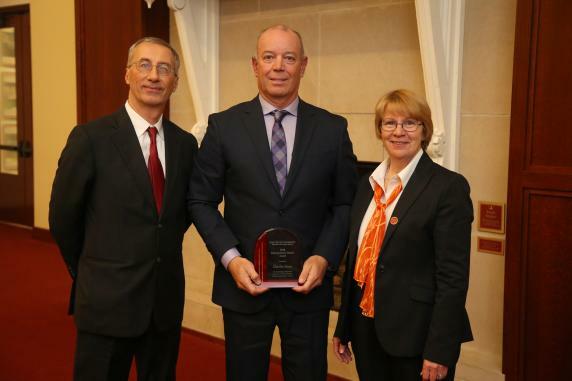 Ames, Iowa—Iowa State University's Department of Computer Science honored Charlie Hunt with the Department of Computer Science Distinguished Alumni Award at an honors and awards ceremony on October 25, 2018 in Ames, Iowa. The award recognizes outstanding alumni from the Department of Computer Science in the College of Liberal Arts and Sciences at Iowa State. Hunt is a Java Performance Architect with Oracle, where his responsibilities span the main pillars of software performance: throughput, latency and memory footprint. He leads a variety of Java and Java Virtual Machine projects whose focus may include one, two or all three of these performance areas. Hunt was the lead author of a popular book amongst Java programmers and developers called Java™ Performance and served as co-author of the Java™ Performance Companion, both published by Addison-Wesley. He is a regular speaker on the subject of Java performance at many world-wide conferences including the premiere Java conference, JavaOne, where he has been recognized as a Java Rock Star. Hunt joined Sun Microsystems in 1999 as Senior Java Architect, and has retained his passion for Java and Java Virtual Machine performance. Prior to his position with Sun Microsystems, he worked as an independent software engineering consultant and held software engineering positions at Motorola and Teradyne. Hunt received his B.S. degree in computer science from Iowa State University, and went on to earn his master’s degree in computer science from the Illinois Institute of Technology.